If the last 48 hours are anything to go by, it looks like Samsung’s marketing team may be gong down the one-teaser-a-day route in the run up to the 2013 Consumer Electronics Show, which officially kicks off in Las Vegas on January 8 – although the Korean company’s media event actually takes place a day earlier on the afternoon of January 7. Yesterday we had the Flickr photo set revealing a “whole new” Smart Hub lined up for launch at CES, and today it’s a short video about a new Smart TV which the tech giant claims on its YouTube page will be “unlike anything the world has ever seen.” With a bold claim like that sending expectations soaring, what’s the betting we’re going to be more than a little disappointed come launch day. Then again, maybe, just maybe, this will have all of our jaws slamming to the ground in shock and admiration when the big reveal comes. The 70-second ad gives away only slightly more than Samsung’s other recent CES video teaser, The World Awaits, put out earlier this month (in other words, almost nothing). This new one is essentially a fancy skit showing a bunch of TVs of various shapes and sizes – some of which can talk – making there way on buses and in taxis to CES, where they all gather in a room in front of something under a sheet which we can safely assume to be Samsung’s new TV set – the TV set which will be unlike anything the world has ever seen. Ever. Digital Trends will be at CES 2013. We’ll let you know. 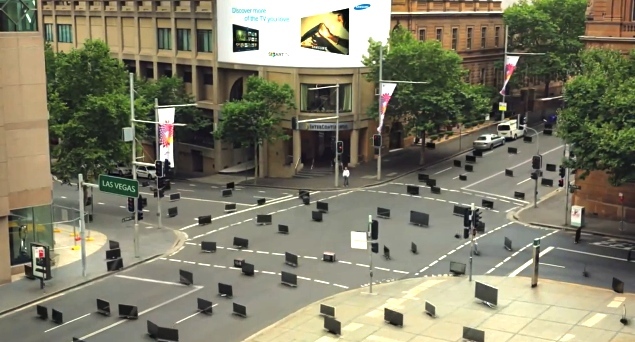 The ad closes with the line, “All the TVs are rushing to see Samsung’s new TV.” You can check it out below.